Update 19 June 2015: media coverage in Hume Leader. Honest History’s research on the ‘Ataturk words’ of 1934 is here, summarised in a media release. Our work complements the article by Paul Daley in the Guardian Australia, which in turn took up a theme explored by the Turkish writer, Cengiz Ozakinci, in the periodical, Butun Dunya. Paul Daley’s article has since been translated into Turkish in at least two journals published in Turkey. 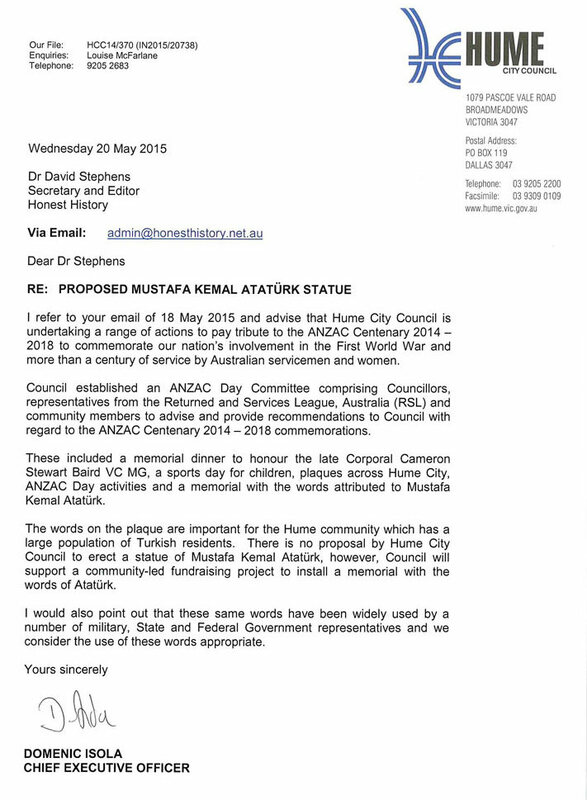 Reading that the City of Hume, Victoria (taking in Broadmeadows, Craigieburn, Sunbury, Tullamarine, and surrounding areas) was planning a monument or memorial to Kemal Ataturk, Honest History sent this email on 17 May to the Mayor of Hume, Councillor Adem Atmaca, and each of the other ten Hume councillors. Honest History understands that your council plans to erect a statue or monument carrying the reputed words of Ataturk. Before proceeding, you should be aware of recent research in Turkey and Australia which throws serious doubt on whether Ataturk ever actually said or wrote the words attributed to him. This research is accessible at http://honesthistory.net.au/wp/wp-content/uploads/627-Ataturk-media-release.pdf . The material includes a detailed article by Walkley Award winning journalist, Paul Daley, of the Guardian Australia. No-one denies the power of the words but this power is considerably diminished in the light of this research: almost certainly, the key sentence about Johnnies and Mehmets was an invention by an old Anzac in Brisbane in 1978; on the balance of probabilities, the other words were made up by Ataturk’s associate, Sukru Kaya, for personal and political reasons, 15 years after Ataturk’s death. Honest History would welcome the opportunity to address a meeting of your council on this subject. The mayor and each councillor was shown as receiving the email. The key points in Mr Isola’s letter were his advice that, among planned commemorative activities in Hume, are ‘a memorial with the words attributed to Mustafa Kemal Ataturk’ and his concluding remark ‘that these same words have been widely used by a number of military, State and Federal Government representatives and we consider the use of these words appropriate’. Thank you for your prompt and considered response of 20 May 2015. Honest History notes the range of commemorative activities planned by your council. It is good to see that you use the terminology “the words attributed to Mustafa Kemal Ataturk”. Certainly, on the basis of the research done by Honest History and others recently, it is difficult to put the provenance of the words any higher than that. Our research is continuing and we will keep Council informed about it. Meanwhile, Hume would mark itself as a leader in commemoration if it resolved to unveil a plaque using the “attributed to” formulation. While there is so much doubt about whether Ataturk ever said or wrote the words in question – and it is almost certain that he was not responsible for the crucial “Johnnies and Mehmets” sentence – it diminishes the act of commemoration to go on using the words unqualified, regardless of how many times they have been used previously by others. Persistence does not rectify errors but it certainly props up myths. Thank you for your email of earlier today enclosing a reply to my letter of 20 May 2015. To my mind, I would think it always better to ere on the side of accuracy whenever possible. Thus “attributed to” would be a far better way of handling this question than anything else which almost declares “thus sayeth Ataturk”. Keep up the good work, HH. It will be interesting if anything else turns up. As a strong supporter of Honest History’s objectives, I fail to see the point of Honest History going any further with this. The point about accuracy of attribution is entirely valid, and is a credit to those who pursued it from a scholarly point of view. However, the exact percentage of phraseology that can be traced to Mustafa Kemal (or to anybody else) is only worth a footnote, not a campaign. The point about the “Ataturk Letter” is that successive Turkish governments have endorsed it as a forceful symbol of their extremely gracious forgiveness of a bunch of British Empire colonials who invaded their land, killed tens of thousands of Turks, departed having achieved nothing, and then proceeded to claim a form of sacred attachment to that Turkish soil. I was embarrassed and disgusted when our current Prime Minister, at the centenary dawn service at Anzac Cove, made no mention whatsoever of the Turks as the gracious hosts they have been for so many decades of these Anzac commemorations. The Kiwi Prime Minister, John Keys, put him to shame with a balanced and moving recognition of the Turkish suffering then, and hospitality now. Australian Turks in the City of Hume are contributing not only to Australia, but also to the fostering of interpretations of a living Islam that are compatible with modern democratic states, as promoted by Mustafa Kemal since the 1920s. Would Honest History propose the replacement of stained-glass windows because the historical accuracy of the Gospels is questionable? Do we reject Keating’s Redfern Speech because we believe that Don Watson was the substantial author? We should accept the substance and meaning of the “Ataturk Letter” in the grace with which it was offered and for what it means today in Australia. The logic is that because the words have been cited by ‘a number of military, State and Federal Government representatives’ than it becomes an unquestionable fact.